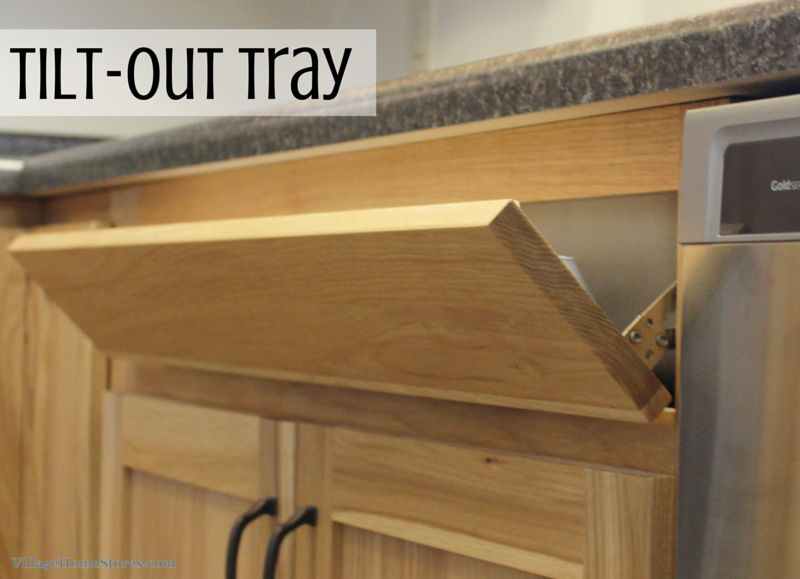 Great storage doesn’t have to be boring or sterile looking. This Galva kitchen is proof that great storage can be stylish, warm and inviting. 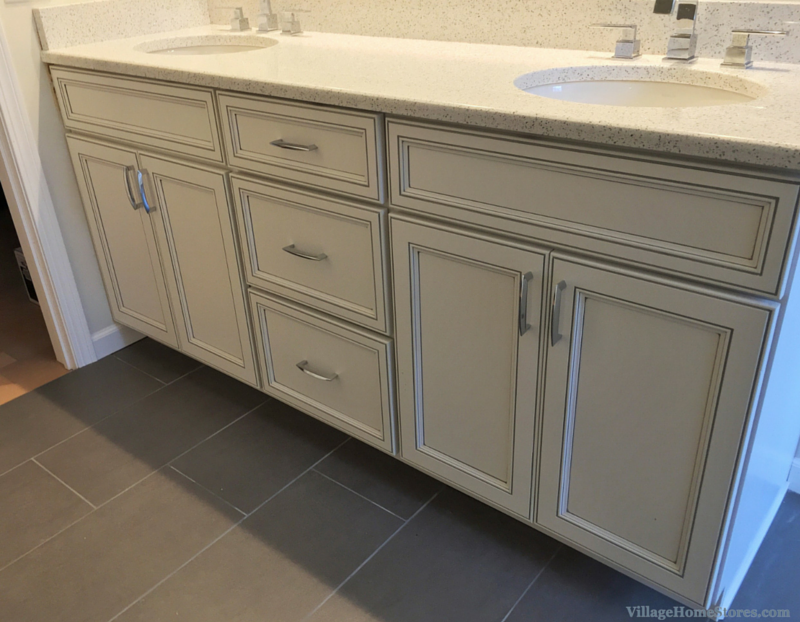 Rustic Beech cabinetry and Silestone Quartz countertops make a stylish first impression and what hides inside of these cabinets gives amazing function to the space. 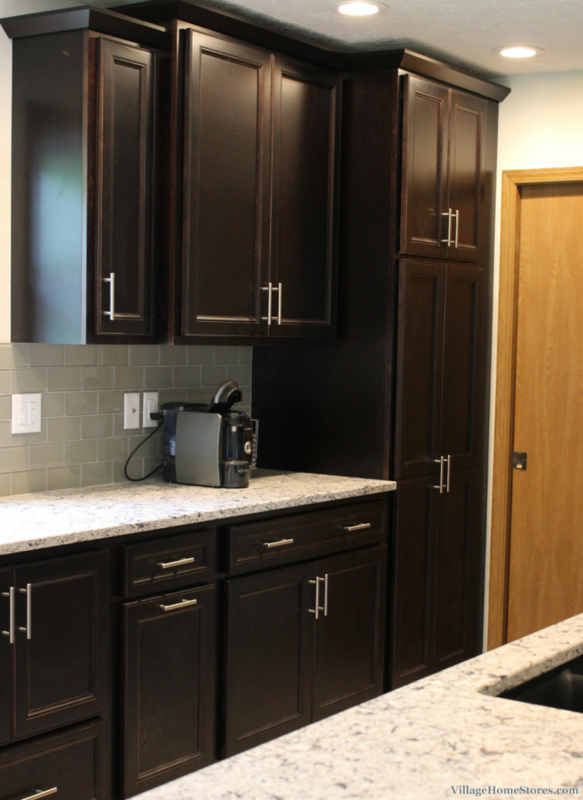 Updated materials and up-to-date storage solutions fill this new kitchen design. No extensive wall-work or major structural changes were made to the room. 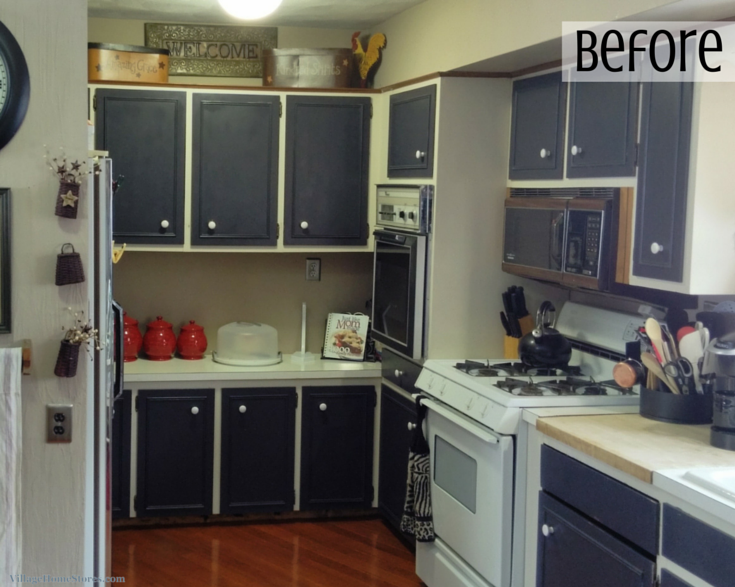 A similar layout to the original kitchen was recreated with better storage and updated materials in mind. Dated soffits above were removed and by keeping a similar layout to the original design, all of the current hook ups for the appliances were able to be used. 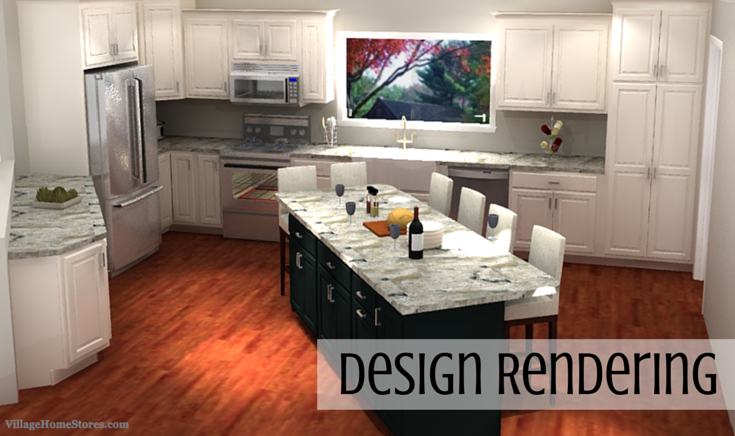 An L-shaped layout with a peninsula extending from the back door entry provides plenty of countertop space. 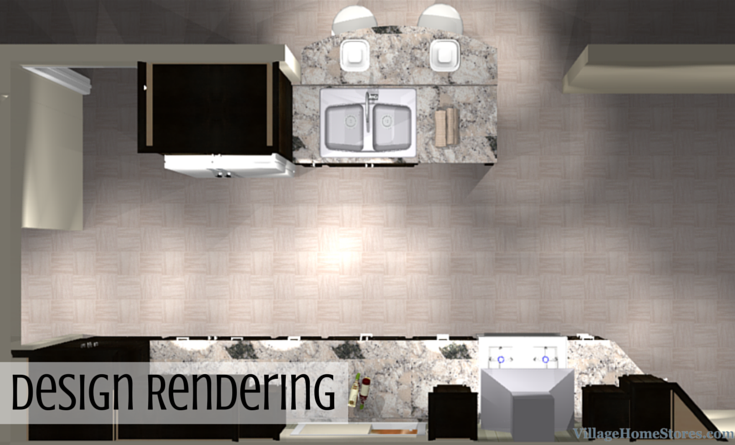 Here is a birdseye view of the new kitchen design. With limited space near the sink, the dishwasher needs to be located in another area. Surrounded by base cabinets in the peninsula, the dishwasher is still within reach of a user loading from the sink. It is also important to note when looking at this layout from above that appliance doors need to have a clearance to open. 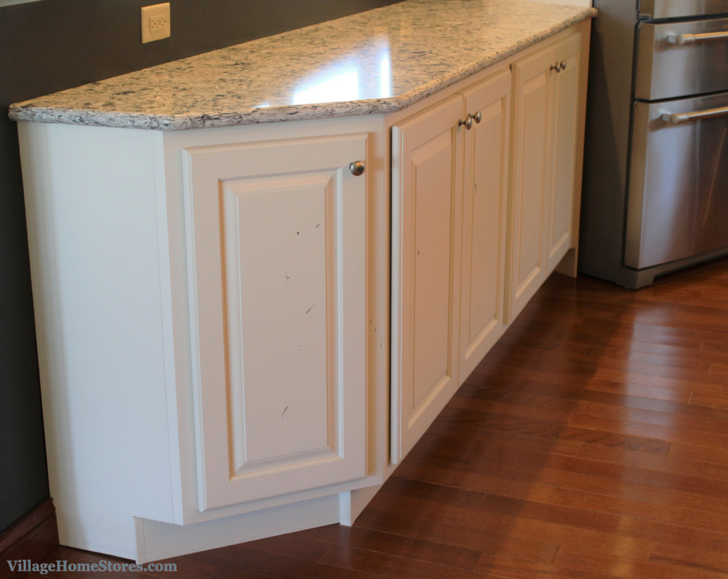 The location of this peninsula allows for the dishwasher door to be open and just enough room to make your way around the open door. The same can be said about the oven door right across from the dishwasher. 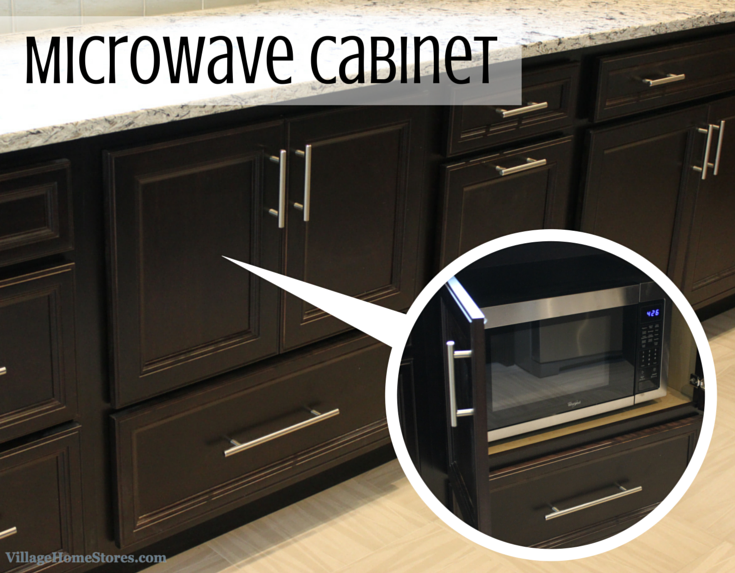 The peninsula cabinets surrounding the dishwasher offer great storage within. 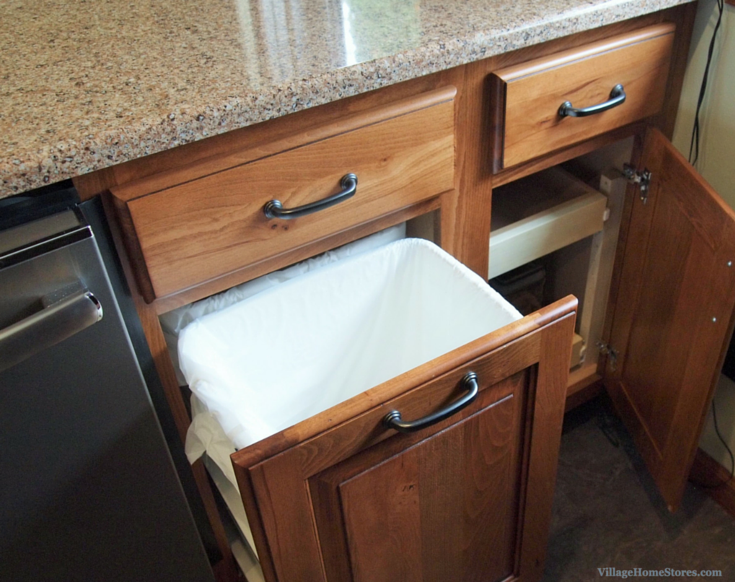 A double-bin pullout trash cabinet is located to the right of the dishwasher and sliding shelves inside of the base cabinetry are adjustable to accommodate anything you would want to fit within the 24″ deep space inside. Having this long area of countertop right in the center of the new kitchen is absolutely perfect. 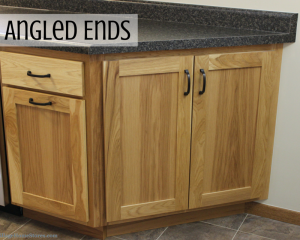 This countertop is nothing you have to be careful with either. Silestone Quartz is a man-made engineered material that is ideal for busy kitchens and is even used in commercial kitchens. It is extremely durable and completely non-porous. 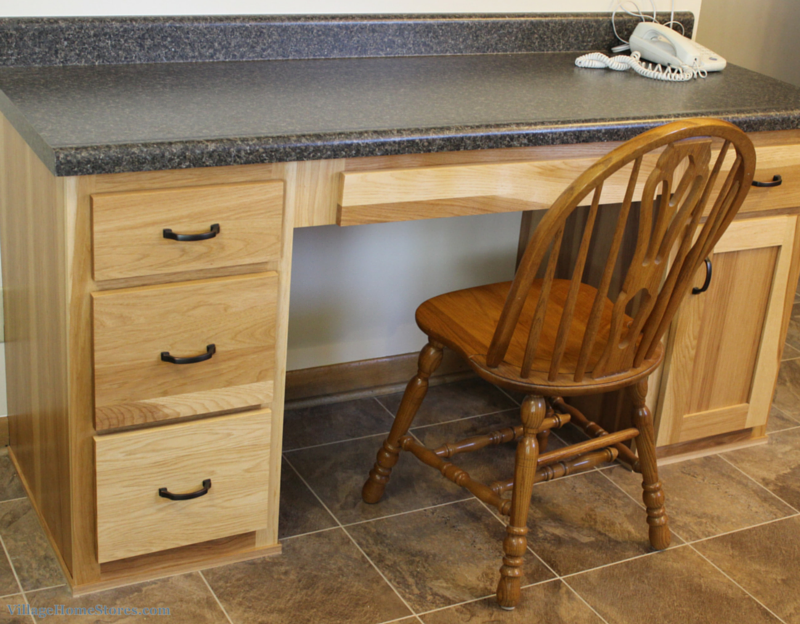 Imagine how great this counter will be for rolling out Christmas cookies to cut and bake! 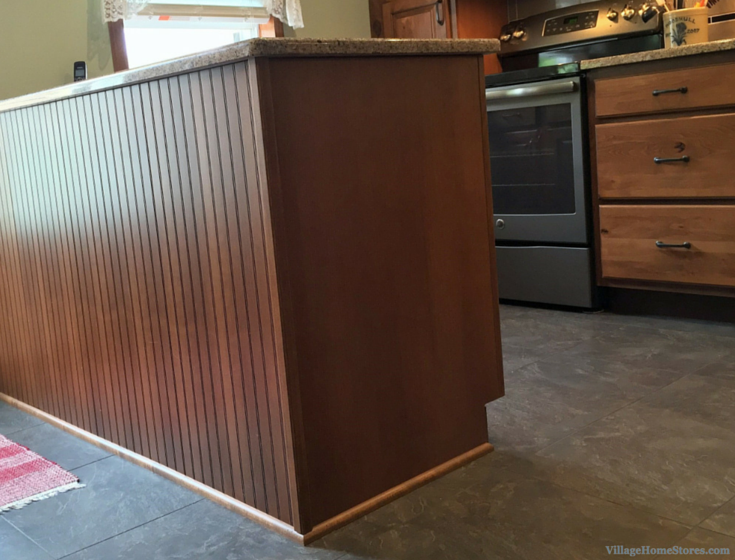 The back panel of this peninsula is a “beaded” or “beadboard” look. 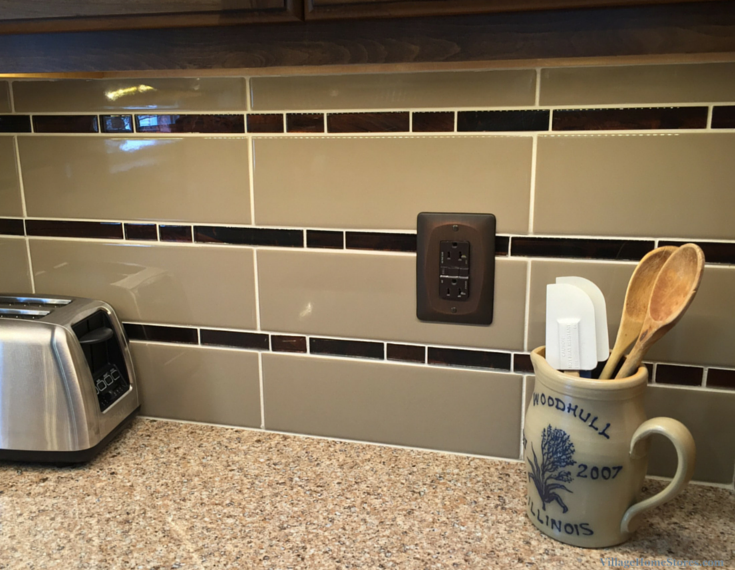 This gives the “Chocolate” accent glaze on the “Briarwood” finish a chance to stand out and add some interest to the view into the kitchen from the front entry. Another important change to mention is the original kitchen had carpet located on the floor. New Luxury Vinyl Tile, or “LVT” has been installed with a grouted look. Still softer and warmer than ceramic tile, this material will be far easier to keep clean in the new kitchen. The refrigerator is located in the same area but has been given a more built-in appearance. 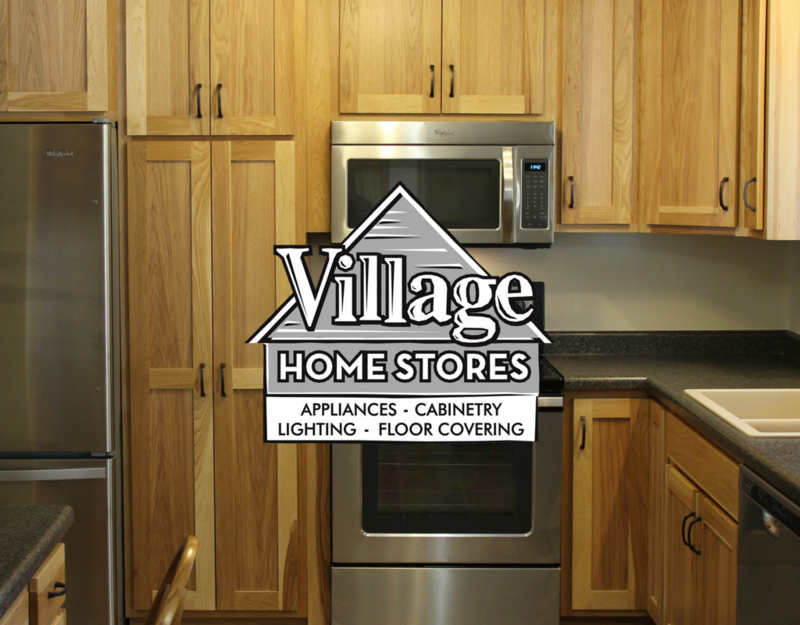 With the refrigerator in clear view of both entrances into the kitchen, the designer from Village Home Stores didn’t want such a large appliance to distract from the amazing overall design. This may seem like a silly thing to point out but imagine if bright white plates were used. That would distract instead of compliment the overall look. 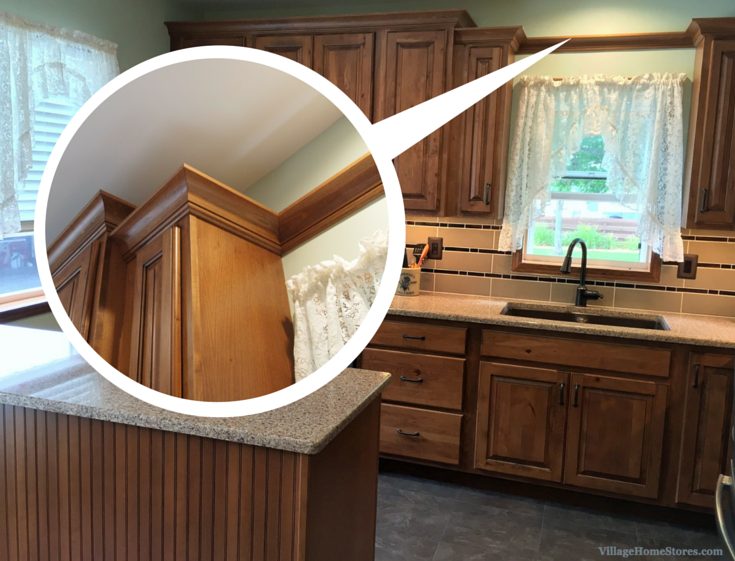 Above the original kitchen sink and below the drop-down soffit was a wood valance. Valances still continue to be a great way to complete an area surrounding a window. Our carpenters worked with the homeowner to create a valance-like installation above the window as a way to bridge the wall cabinets surrounding it. 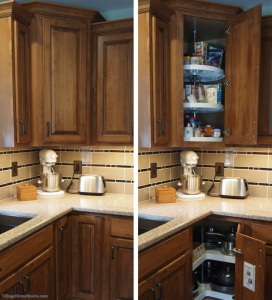 A base cabinet below with four adjustable sliding shelves provides 24″ deep storage space to move into. 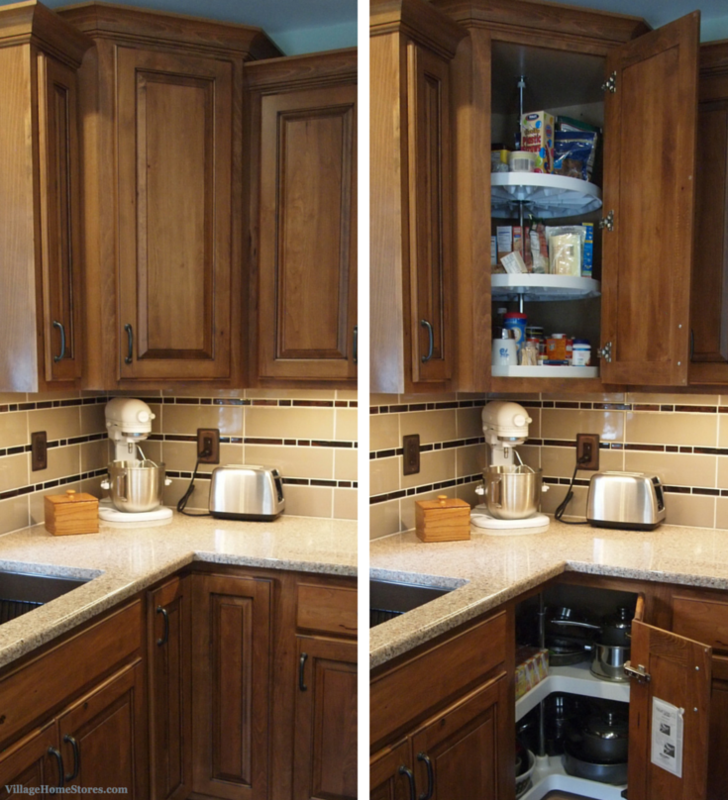 Four shelf spaces in the 12″ deep wall cabinet above can be used in a number of ways as well. The addition of a third cabinet here gives a visually full look to the space from floor to ceiling but the added bonus of counter space right in the center of the pantry area. What’s not to love about a kitchen made better? 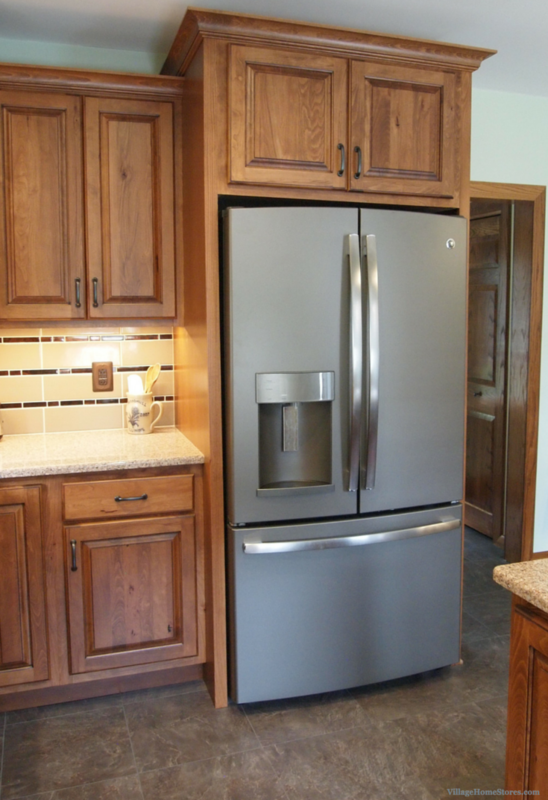 We thank this Galva, IL family for allowing us to help update their kitchen and also for letting us show you around. 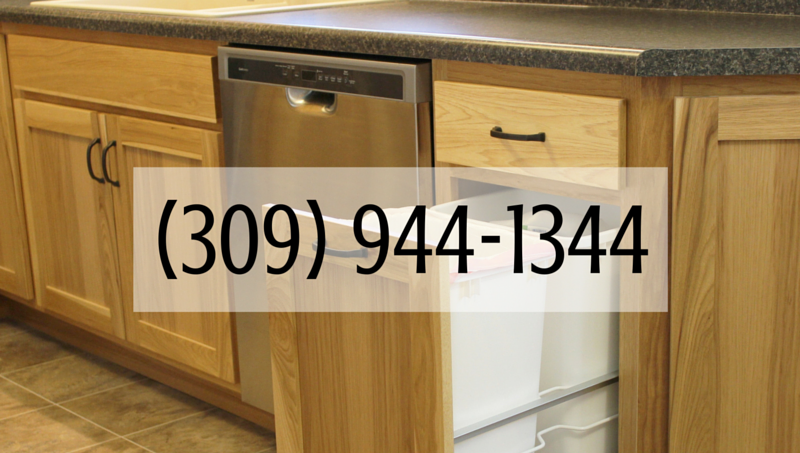 If you have any questions about what you have seen here please call or click today. We are ready to help get your started on your own project. The term “Rustic Transitional” is becoming more and more common all across the home interiors industry. 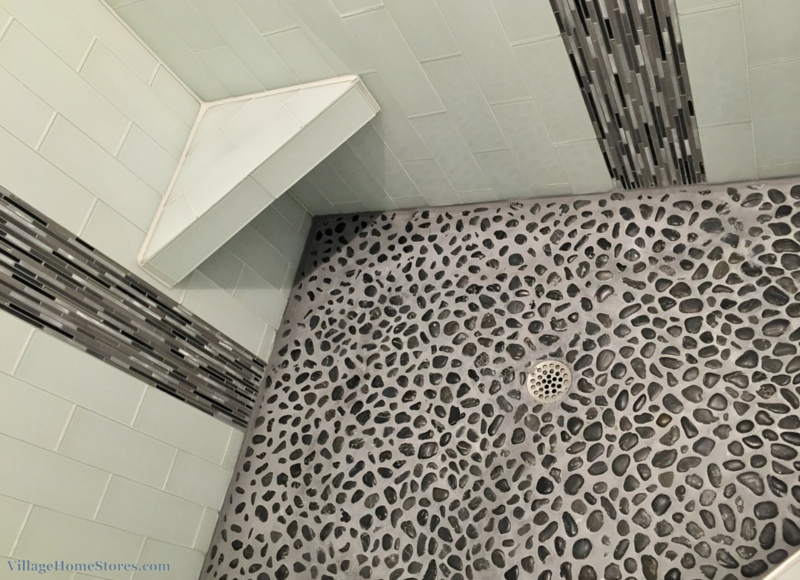 This featured project in Cambridge, IL is a wonderful example of of Rustic Transitional materials and style. The story to be told however, is more traditional in nature. This home has a rich history with the current residents. Like many of the many homes in rural Henry County, this farmhouse has been in the family for many years. It was the home of the current resident’s grandfather. Years and years of traditions and memories have already taken place here. The new kitchen had to be a way to update the space with respect to the past (and the family home) while adding modern elements for new memories to be made. 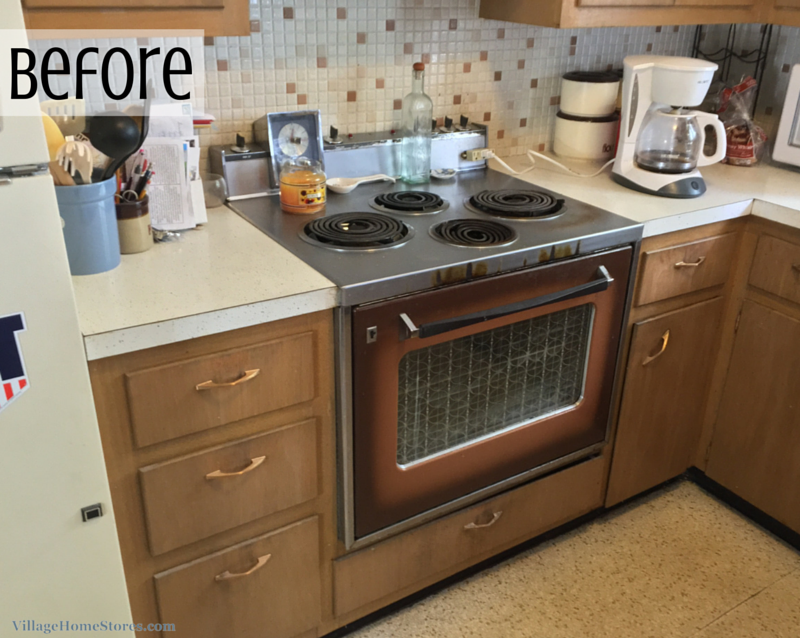 The before photo shows that over time there had been updates and changes made to the kitchen to keep it usable and functional. This time the space was going to need an entirely fresh start. The original layout created a narrow, cramped space and limited the size and location or a refrigerator. 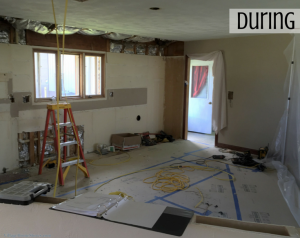 Durian Construction began demo by removing soffits and two walls that chopped up the space. 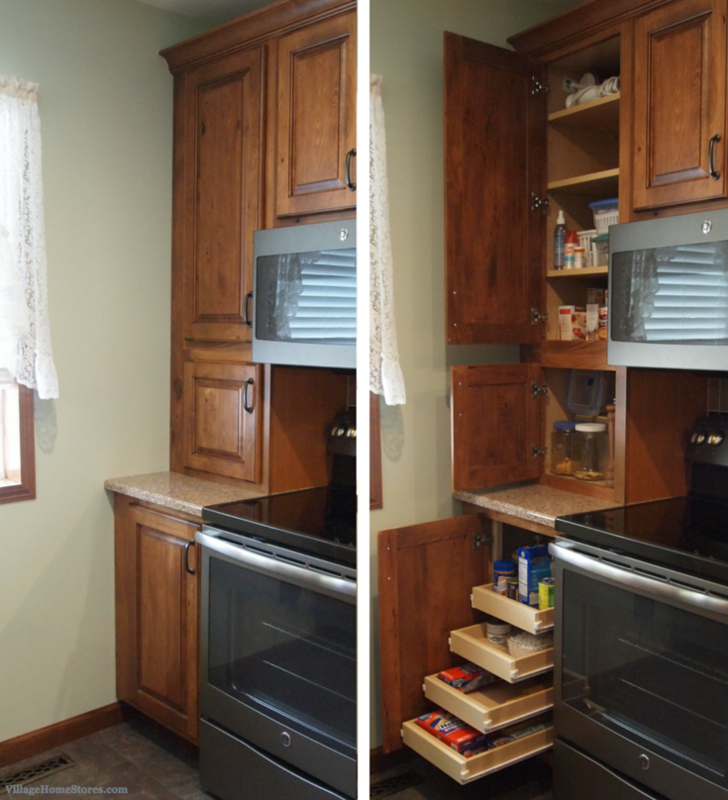 A new 1/2 wall was built to open up the kitchen into the front room and accommodate a new cabinet layout. The existing hardwood was patched with spare flooring to give a seamless look to the two areas without a transition in the floor needed. The refrigerator is now centrally located in the traffic paths of the design. Full access is available to many users from any entrance to the new kitchen. The half-wall dividing the kitchen from the front room runs parallel to a large new island in the center of the design. 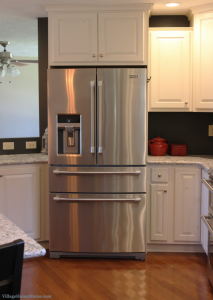 The new design allows for a more current standard-sized refrigerator to fit the lifestyle of this busy family. This new suite of appliances by Maytag includes a 4-door refrigerator and a double oven freestanding gas range with microwave hood above. Stainless Steel appliances bring an updated look to the kitchen but other materials and finishes selected lend a more rustic look. 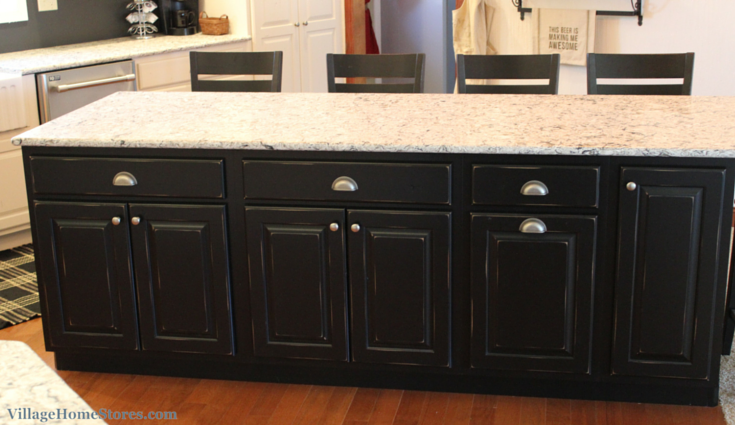 The large kitchen island has been installed in a distressed black painted finish. That finish paired with a single-level design helps the island look more like a large farmhouse table or furniture piece instead of a modern kitchen island. 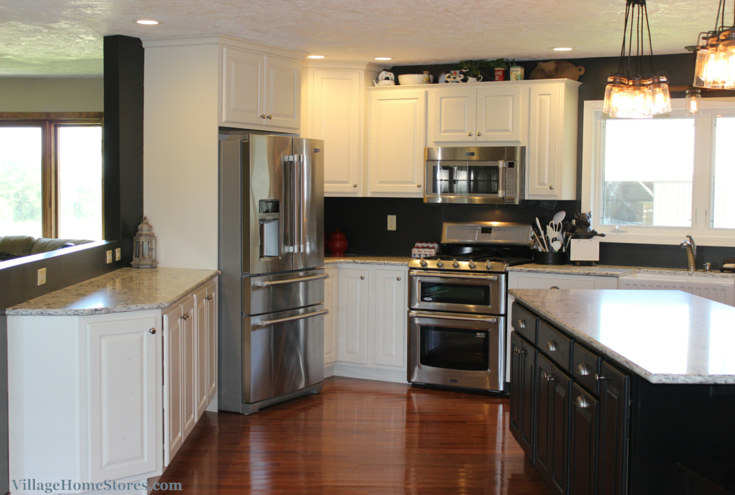 The main perimeter is this new kitchen is a painted “Pearl” finish from our Koch Classic line. 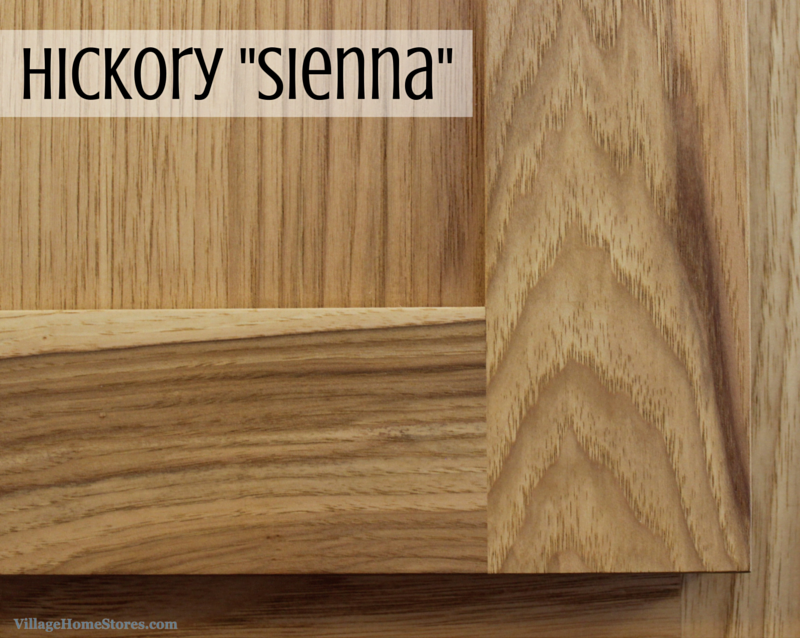 The square raised-panel doors are a common “Transitional” choice but if you look closer the wood species selected gives the main kitchen a “rustic” touch. 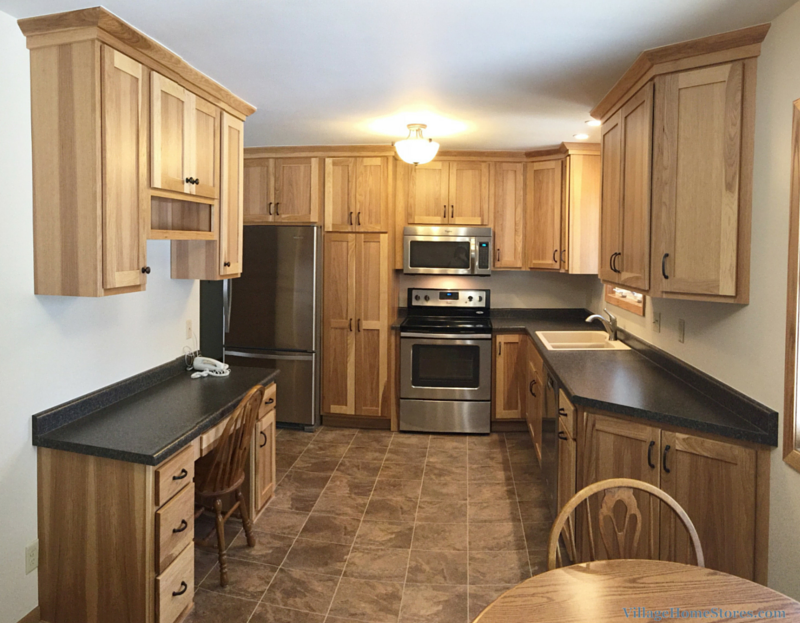 The painted cabinets may look scratched of damaged in these images… when you get a closer look those dark areas in fact are character knots in the Rustic Beech wood. 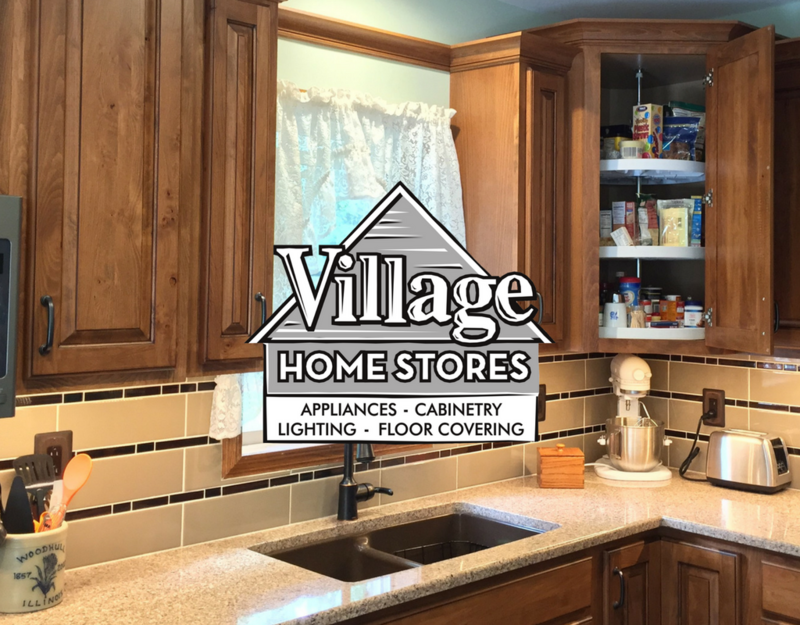 One of the most exciting areas to include a “Rustic Transitional” style into your kitchen is in your hardware selections. 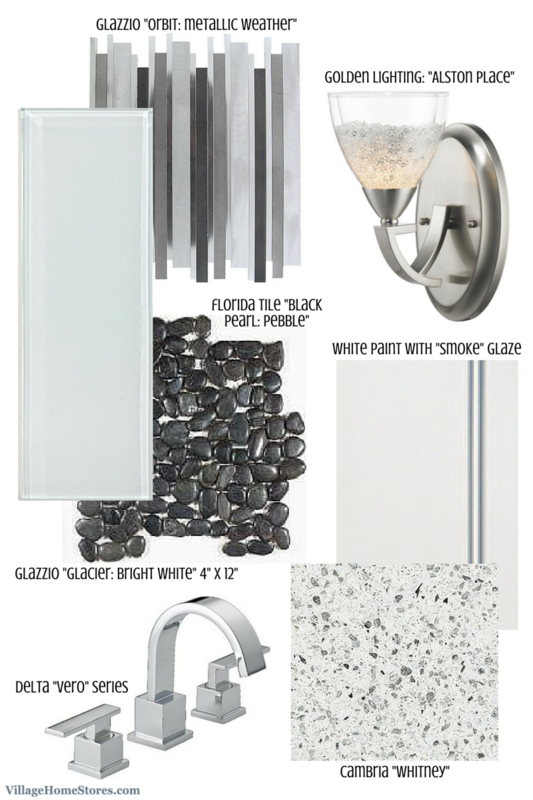 Cabinet hardware, plumbing fixtures, and lighting all can be modern interpretations of old rustic farmhouse charm. A farmhouse sink (shown above) is always a fantastic choice when looking for a “Rustic Transitional” look. 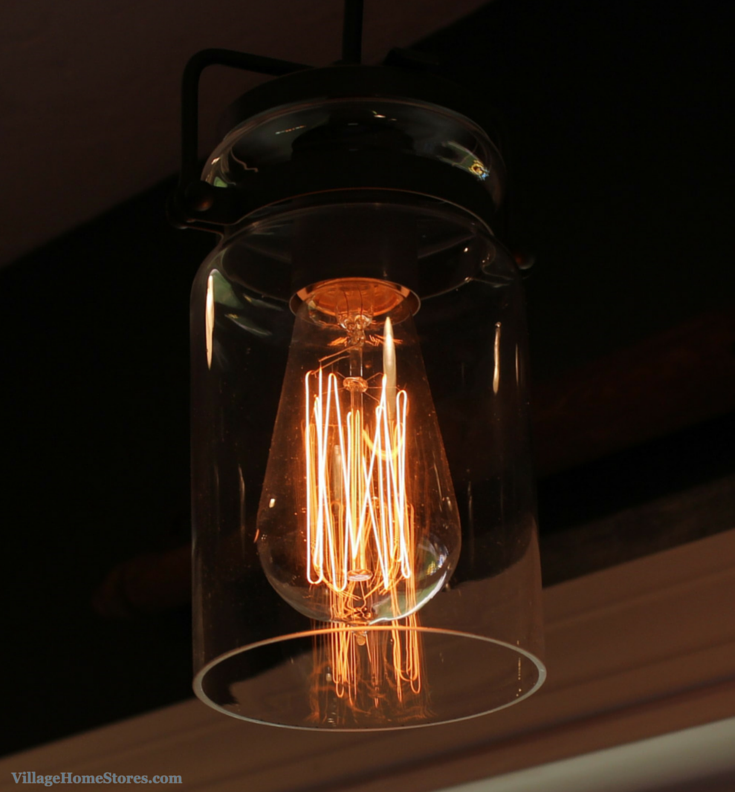 Your lighting is another huge opportunity to really showcase the style of your space. 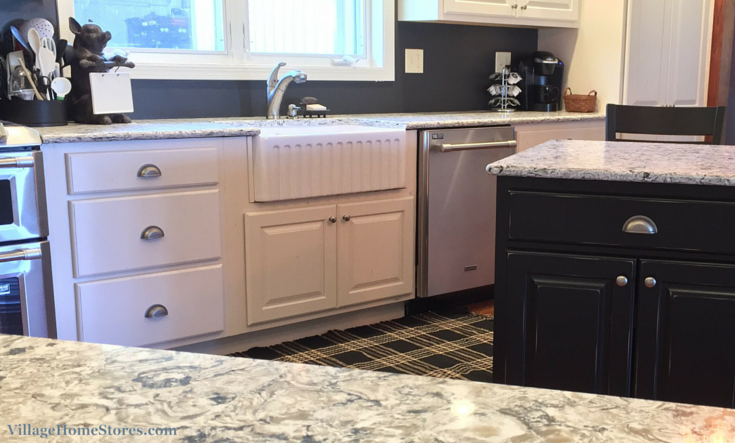 For this Cambridge, IL kitchen remodel the “Brinley” series from our Kichler line was used. The visible “Edison” style filament in the bulb is such an interesting nod to the past. 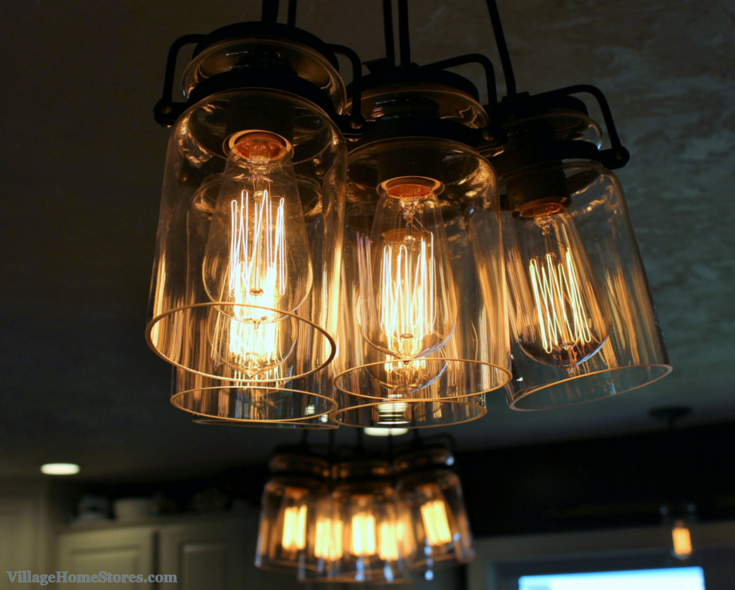 The suggestion of a bundle of canning jars with this lighting collection makes it a perfect choice for this new farmhouse kitchen already rich with memories and traditions. 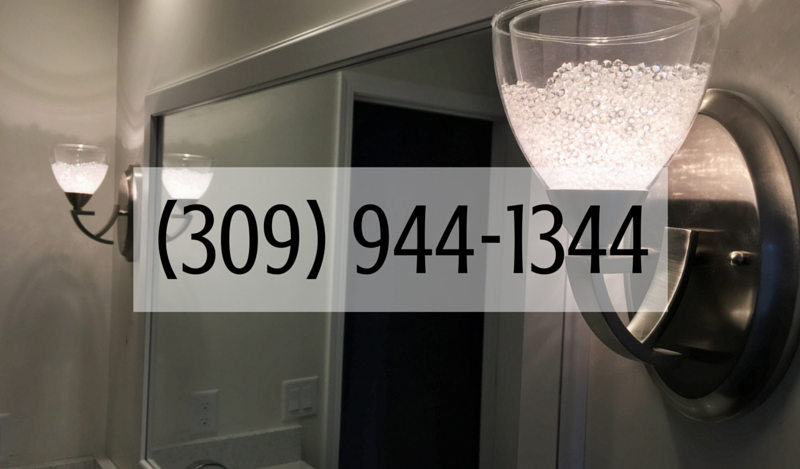 Our expert lighting staff can help you select the perfect lights for your project. 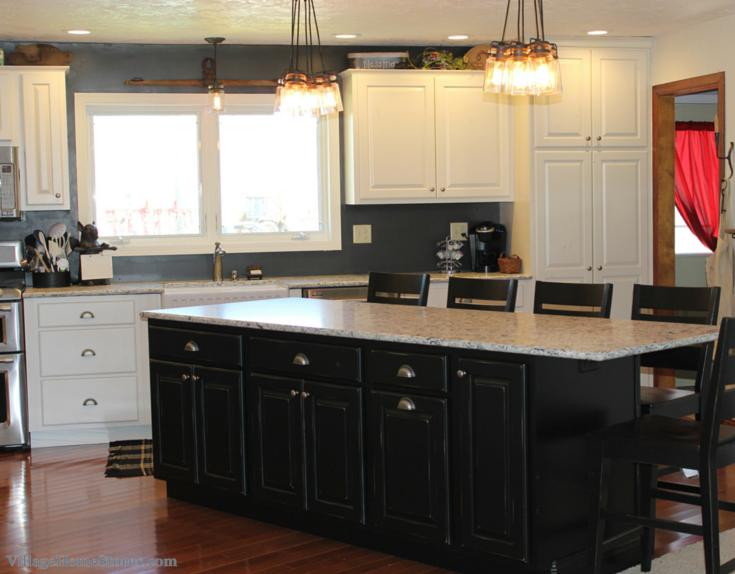 For this project there was no need to find a light that complimented the island fixtures because a single “Brinley” pendant was available and already the perfect choice. This family farmhouse was updated with a nod to the past and a preparation to continue family traditions. 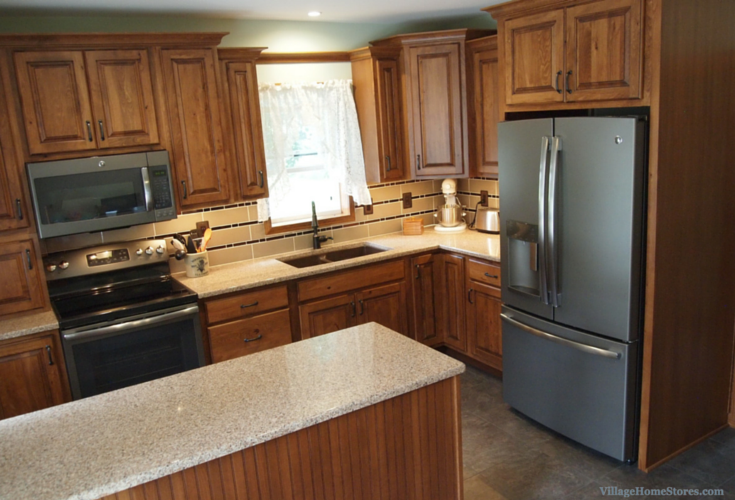 See another great example of “Rustic Transitional” in a past featured kitchen here. and follow our “Rustic Traditional” board on Pinterest. 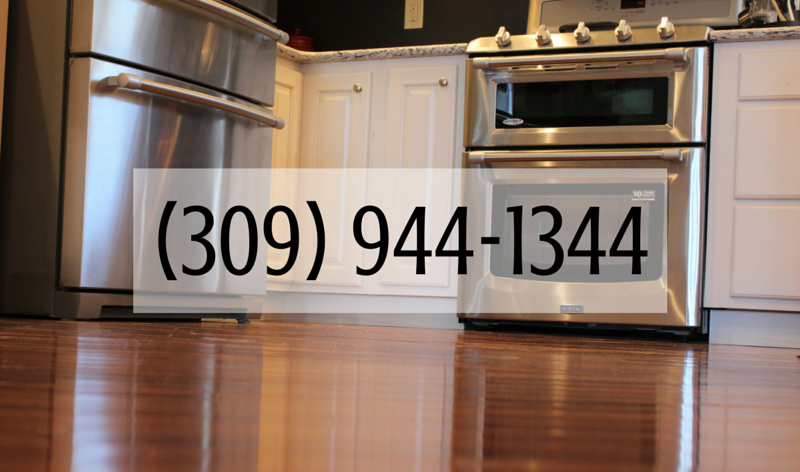 Are you ready to remodel your own space but want a team who can listen and respect the history of your home? Contact us today to set up an appointment. 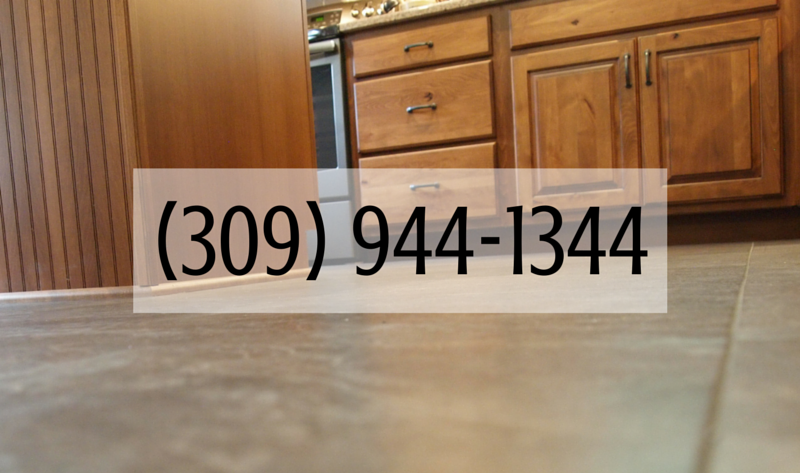 Click here or call (309) 944-1344 to start to conversation. 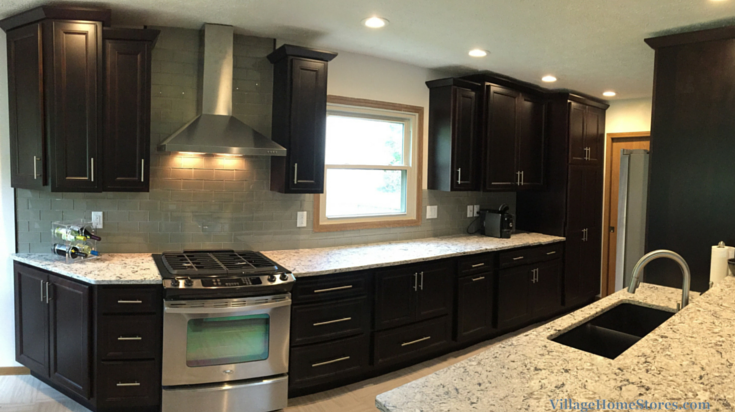 This kitchen remodel in Bettendorf, Iowa is a great example of how you can get your dream kitchen while being budget-conscious. 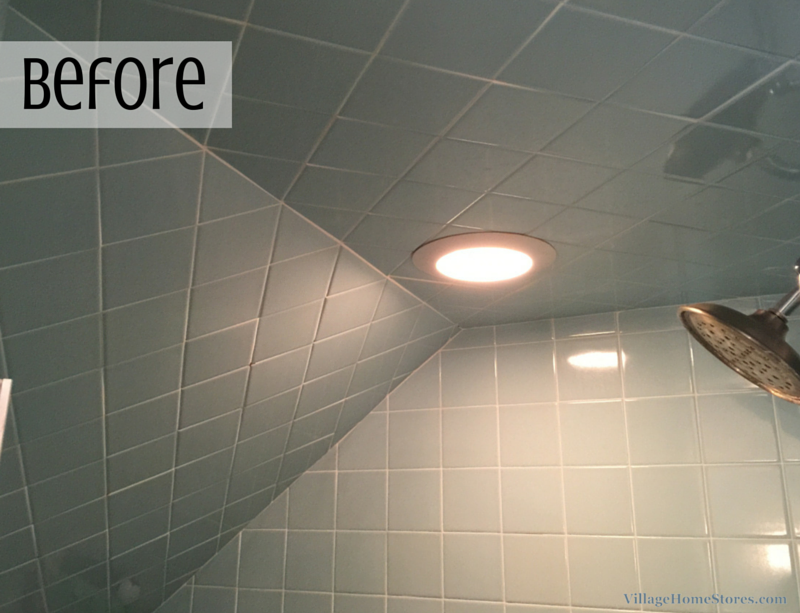 This amazing transformation came about by making smart choices on where to make upgrades within the project. 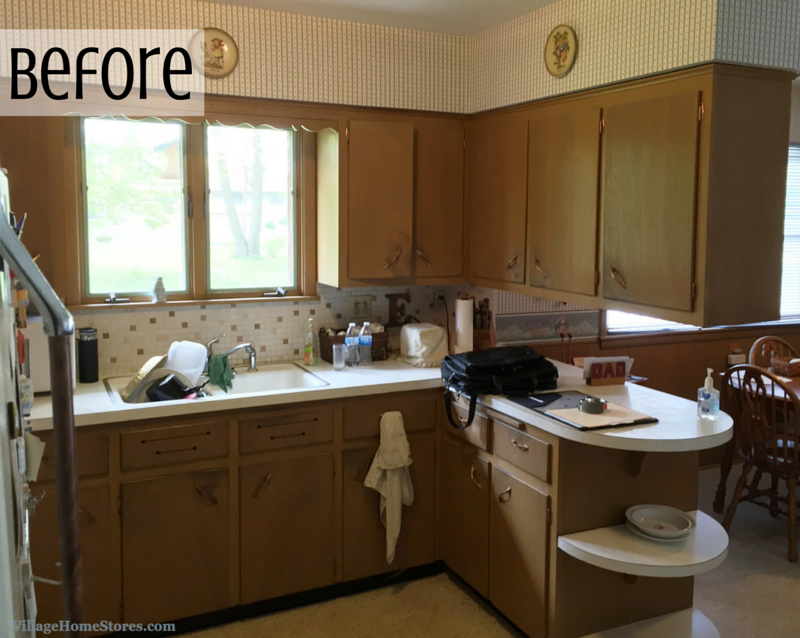 Take a look at where this kitchen began before you see the finished look. 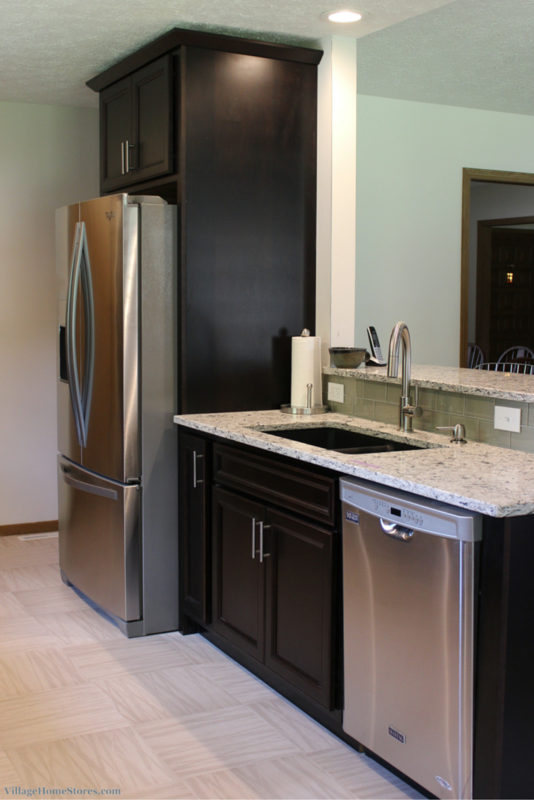 Rich dark cabinetry, quartz countertops, Stainless Steel appliances, an undermounted sink it is all here! 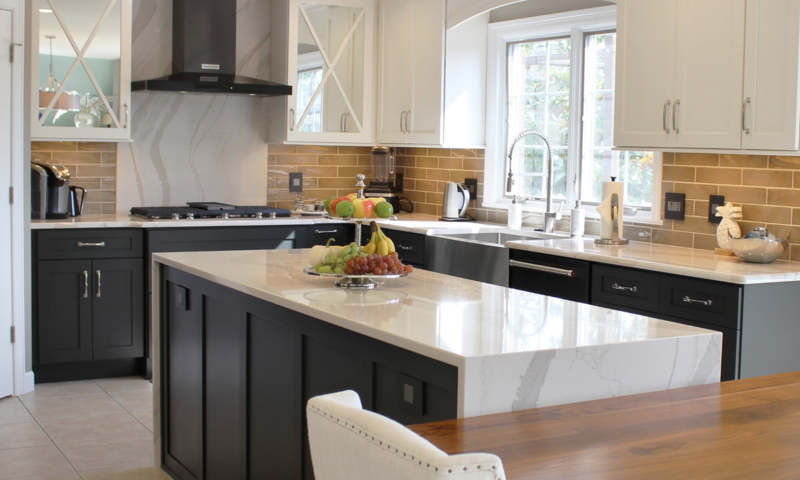 While getting your dream kitchen may be something you do once in a lifetime, that doesn’t mean that you have to keep that project off in the distance. 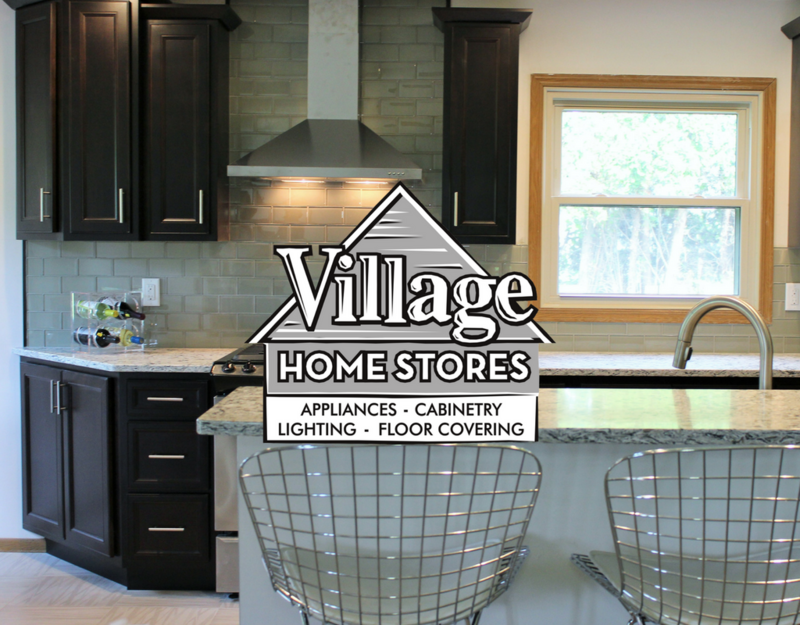 Our designer from Village Home Stores worked closely with these customer to help them stay within their budget and select the perfect materials and make upgrades in the right places to end up with this upscale look. 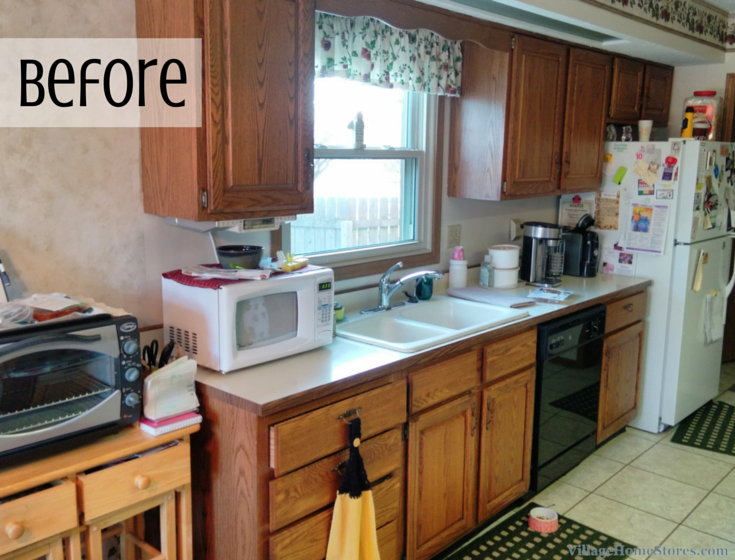 Before we look at some of those upgrades lets take a look at the structural changes made to this kitchen. 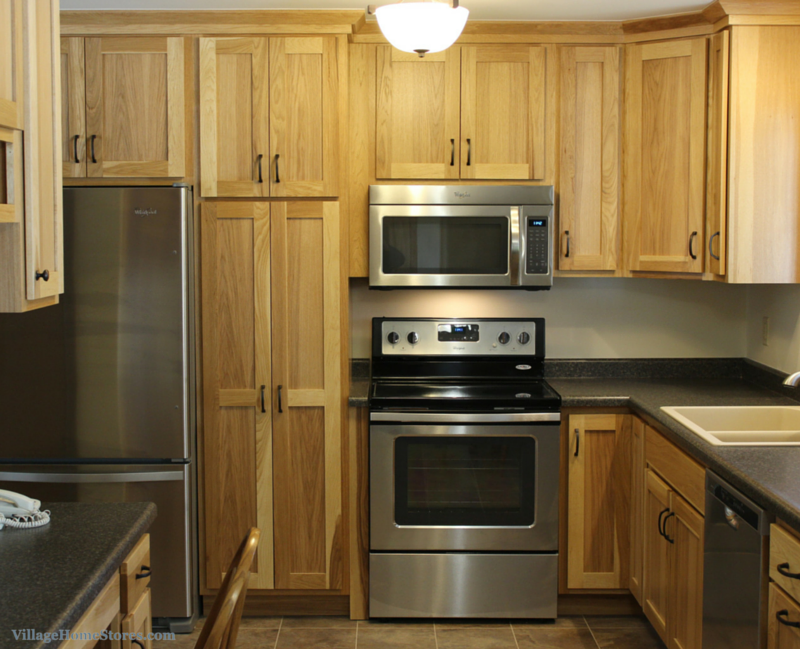 The original kitchen included a wall of cabinetry that surrounded a range and hood unit. This wall divided the kitchen from the Living Room area. We began by opening up this wall to include the new kitchen with the living areas of the home. 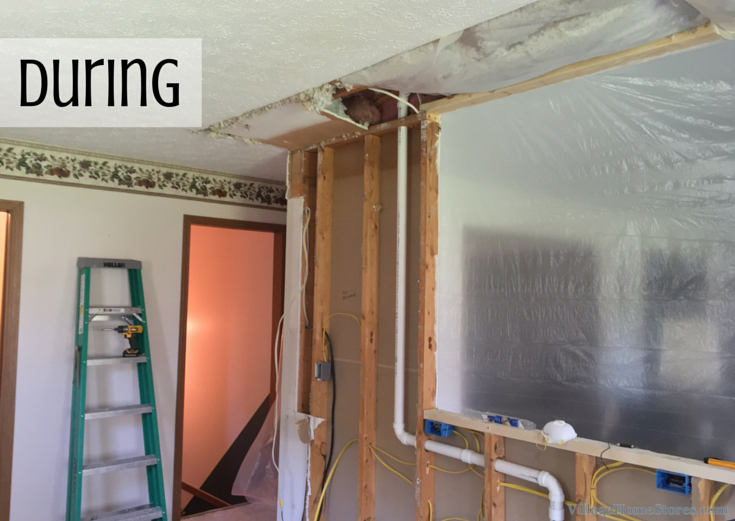 Removing this wall and all of the soffits above made such a huge difference in the finished kitchen. The birdseye view of the new kitchen design (below) shows how a new bar-height top fits into the newly opened kitchen plan. Relocating the sink and range locations represented some of the design choices made to get the best working layout for the now open room. 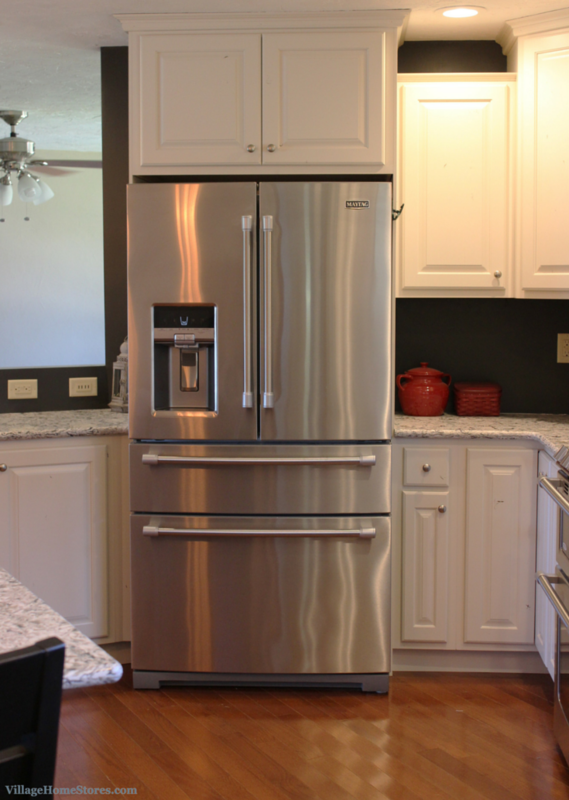 Keeping appliances in their original locations can help when you are trying to keep within a project budget. But this is one design upgrade that was worth it. Now that this kitchen opens up into this great room there is no better place for the sink than right here. Moving the kitchen sink to this new spot facing the guest areas of the home was a great choice. 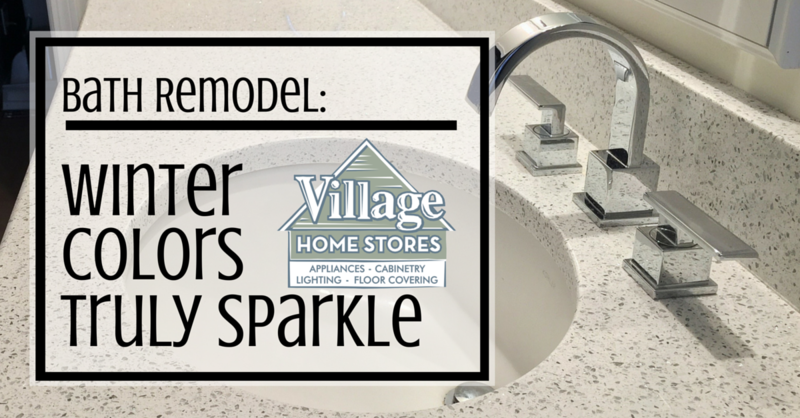 Let’s now take a look at some of the amazing upgrades made to get this upscale look beginning with this sink. An undermounted sink is such a desirable element of a kitchen. If you have ever had one I am sure you would not be easily convinced to go back to a drop-in style. 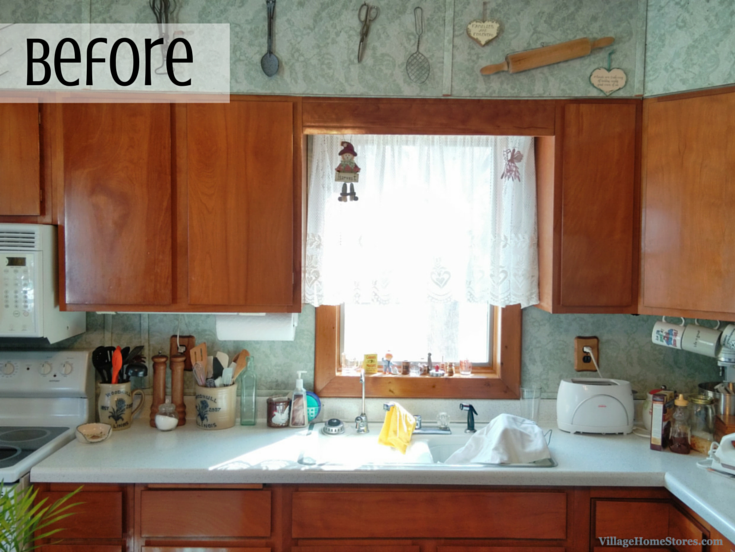 Wiping the counters clean with a single swipe into the sink is a huge benefit. 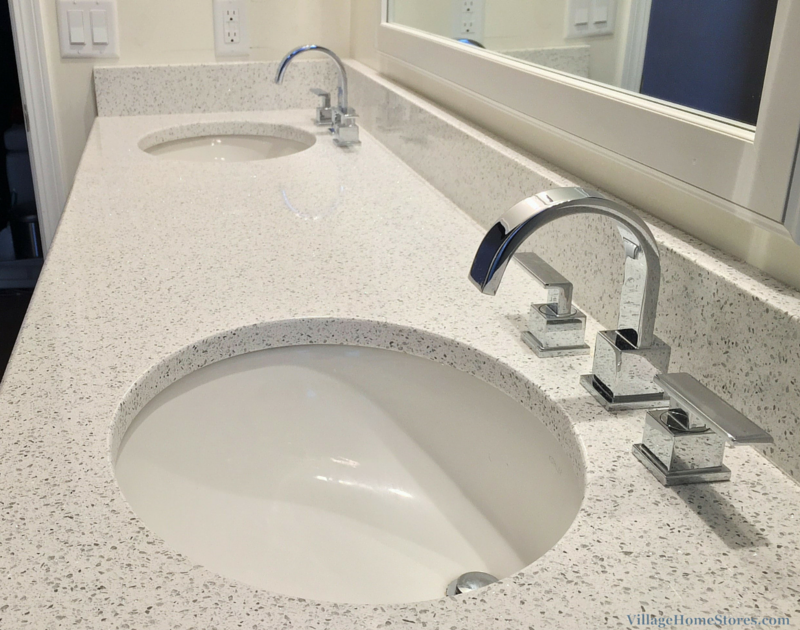 The kitchen sink happens to be an Elkay composite granite sink so it is just as durable as it is beautiful. 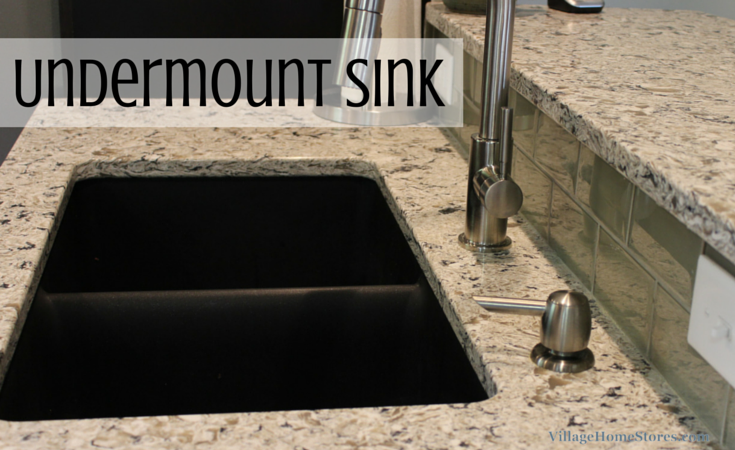 This matte-finished black sink is mounted to beautiful new counters. Quartz countertops in a kitchen we are boasting is budget-conscious?!? Yes! 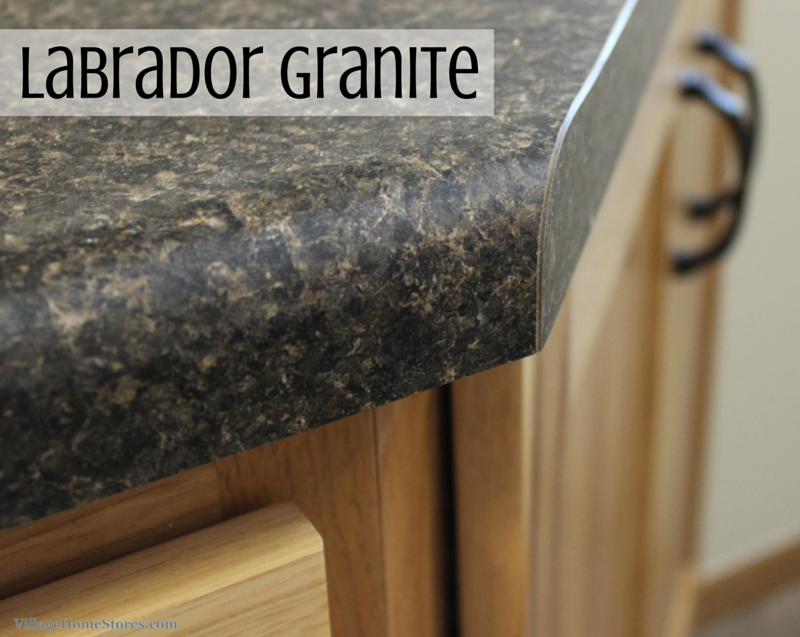 We currently have a series of Quartz countertops at an incredible price in your choice of 9 colors including this popular “Tundra” color. Let us price this Quartz for your project. 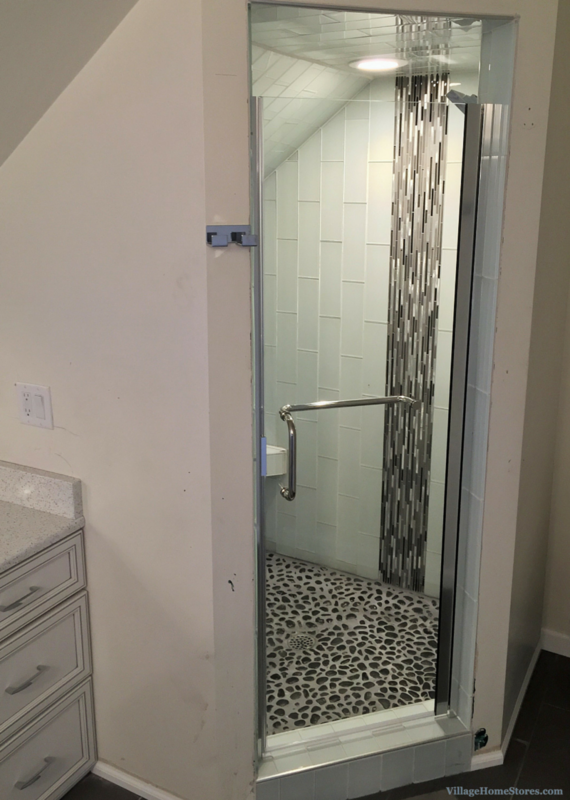 You will be pleasantly surprised by the numbers you will see especially if you have been shopping high-end laminate options or solid-surfaces. Before we get to the cabinetry let us look down to the flooring for another upgrade made that was no extra cost at all. 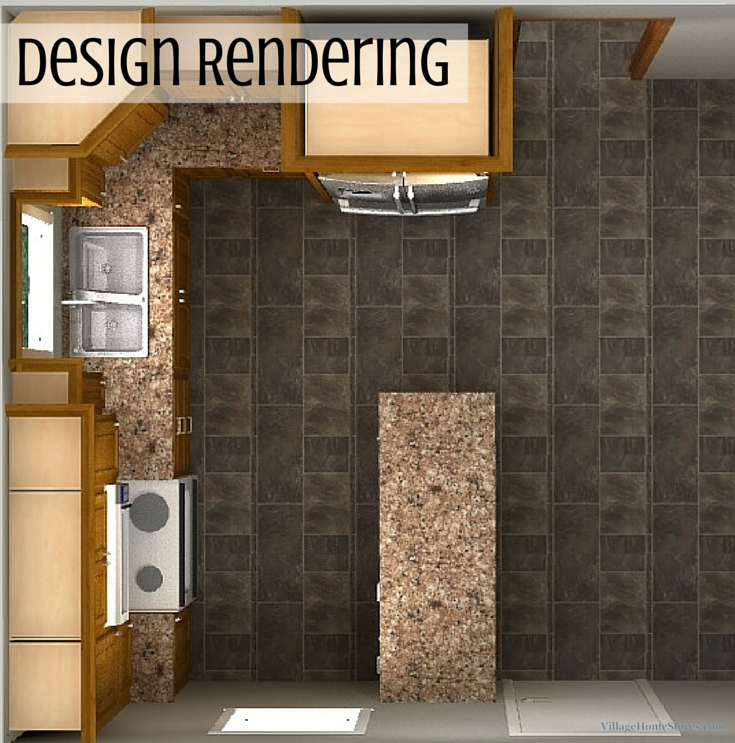 This Luxury Vinyl Tile, or “LVT” as we call it, has been installed in a 1/4 turn pattern. 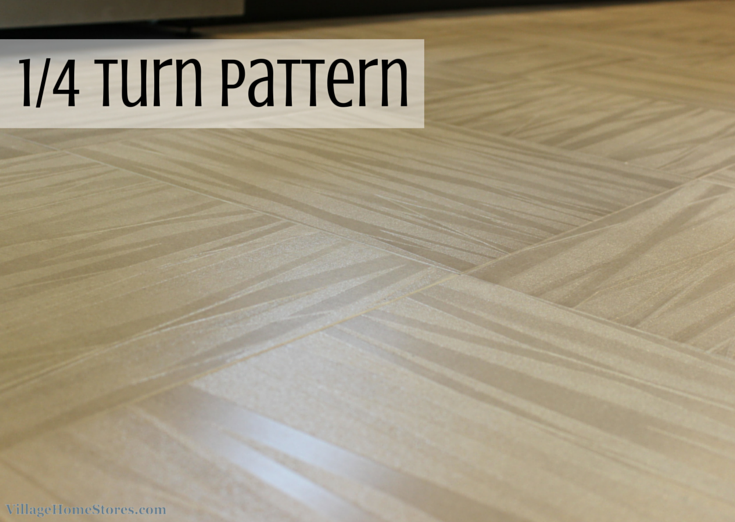 A basic pattern would have also looked great with this “Linea” Cream Mannington LVT, but this extra detail sets it off. The pattern of the LVT and the direction changes create a basketweave look and add an eyecatching result with no extra material required. Read more about LVT in this past blog post. 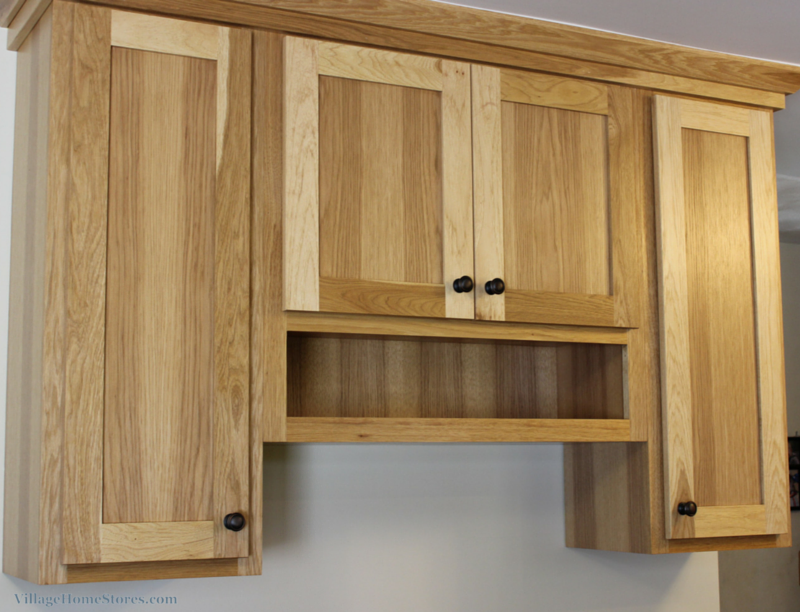 Cabinetry represents such a significant portion of any kitchen project. Our Koch Express line was selected for this project. 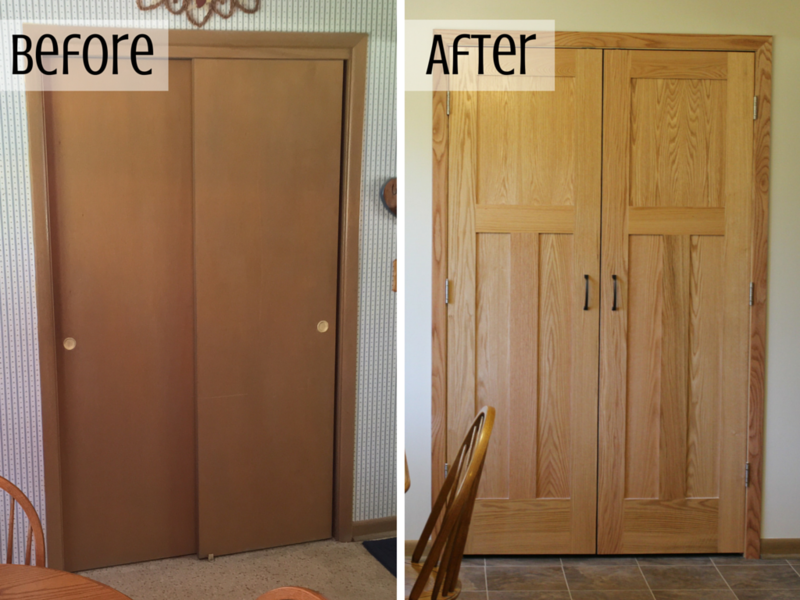 The “Lexington” doorstyle in the rich Birch “Java” finish has been upgraded with soft-close, dovetailed drawers and even soft-close hinges on the doors. Our Koch Express line can also be paired with certain pieces from our Koch Classic line. 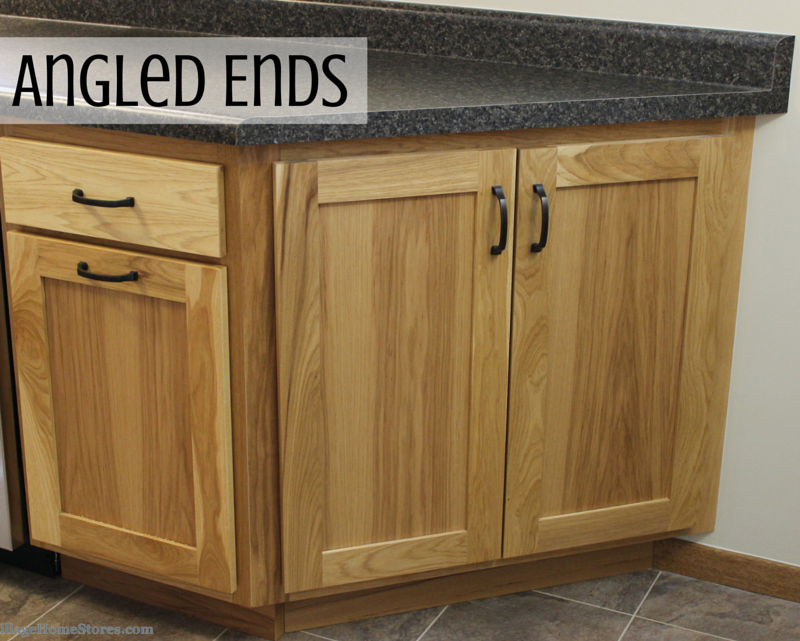 That is how the angled end cabinet upgrade was made to the end of this wall of cabinetry. This angled look gives a visual upgrade from the expected square ends available from Koch Express. 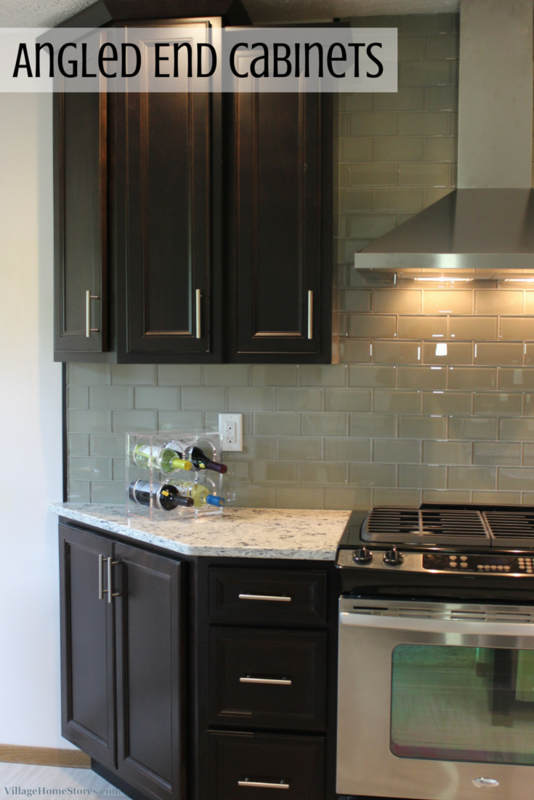 The glass tile backsplash was also a beautiful material selection for the kitchen. See the full album of photos from this kitchen over on our Houzz.com portfolio here. 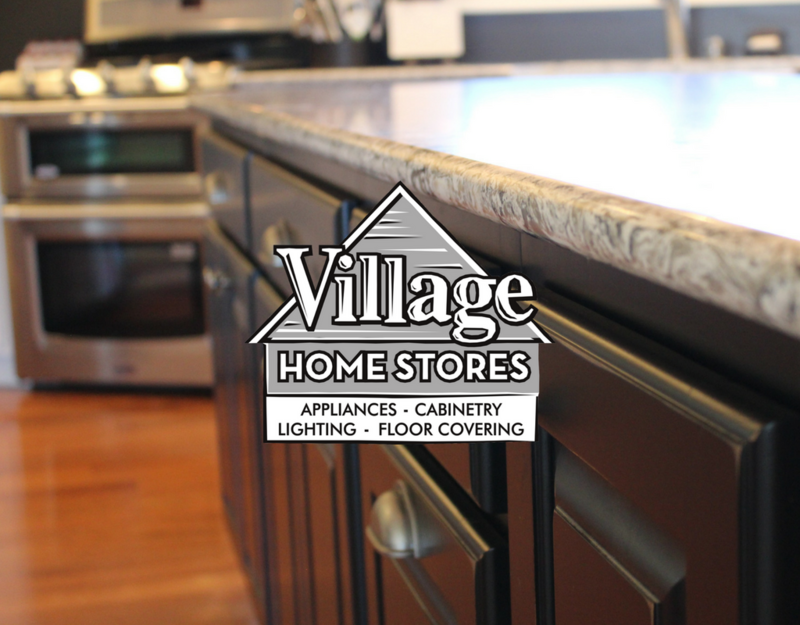 Making smart choices and working close with your team at Village Home Stores is where your dream kitchen project begins. Setting up an appointment is your first step. 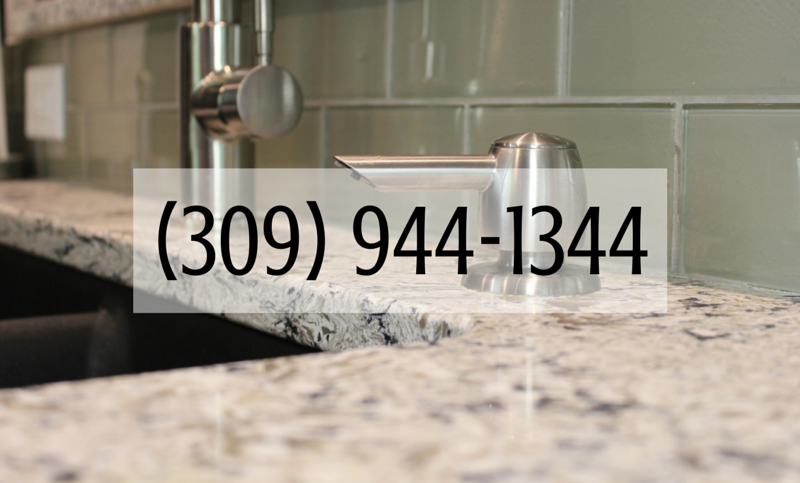 Call or click today. (309) 944-1344.